Tasty Pintxos, Pinchos, or Tapas, whatever you want to call them. Three years ago our family was in the Basque Country (Euskadi) courtesy of my mother-in-law. We had a great time visiting the villages her parents were from and seeing the beautiful countryside and cities. The food we ate was spectacular! We stayed at the Hotel Bolina in Gernika. When we left after 10 days it was like leaving family. http://www.hotelbolina.es. 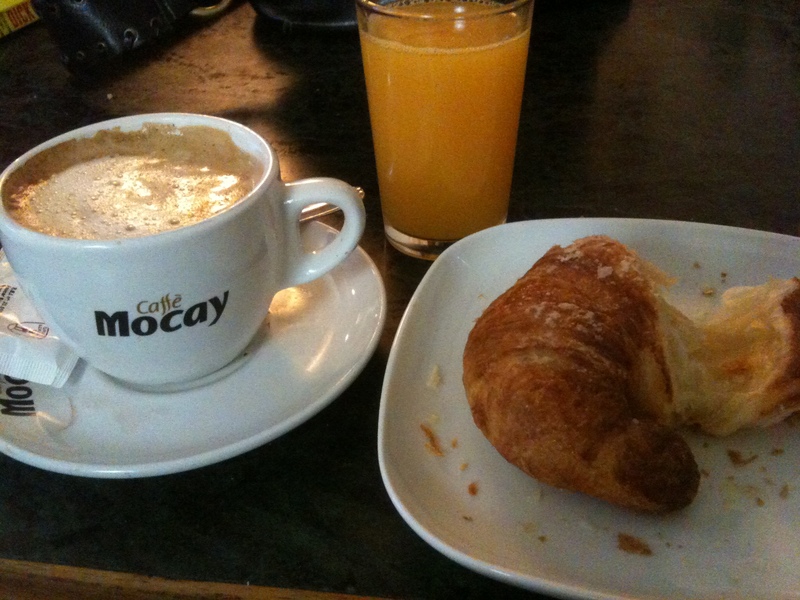 A simple breakfast of cafe con leche and a croissant was something I looked forward to every morning. Dinner of fresh fish caught that morning cooked perfectly and simply along with ensalada mixta and cheese for dessert. Pintxos lined up on the bar where you get a plate and choose a few pintxos to eat and pay the bartender based on how many toothpicks are on your plate. The variety of pintxos was mind boggling. A pintxo (pincho) is a snack, but you can make it into a meal. It is typically eaten in bars and is especially popular in Euskadi, where they are regarded as a cornerstone of local culture and society. They are related to tapas, the traditional Spanish snack, but the main difference is pintxos are usually “spiked” with a skewer or toothpick, often to a piece of bread. They are served in individual portions and always ordered and paid for independently from the drinks. Cafe con leche, croissant and freshly squeezed orange juice at the Hotel Bolina. 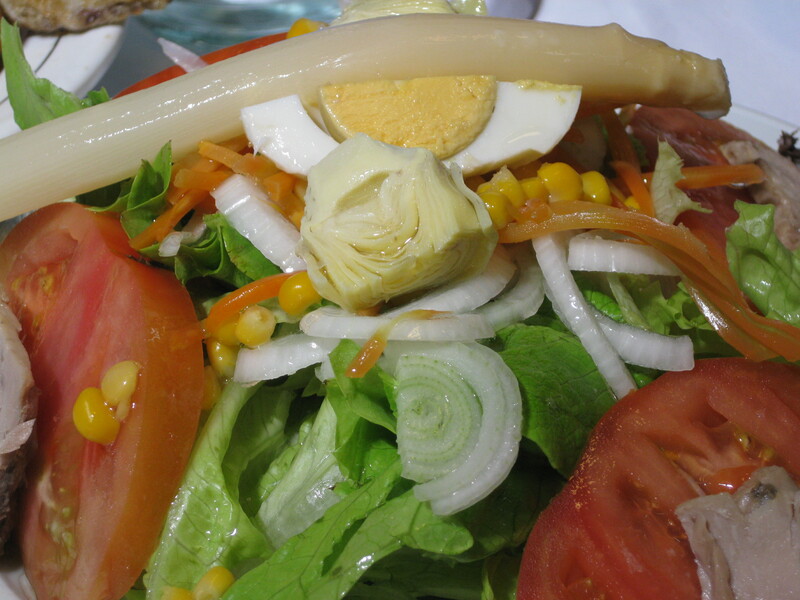 Ensalada mixta at Hotel Bolina in Gernika. Pintxos at a bar in San Sebastian (Donostia). 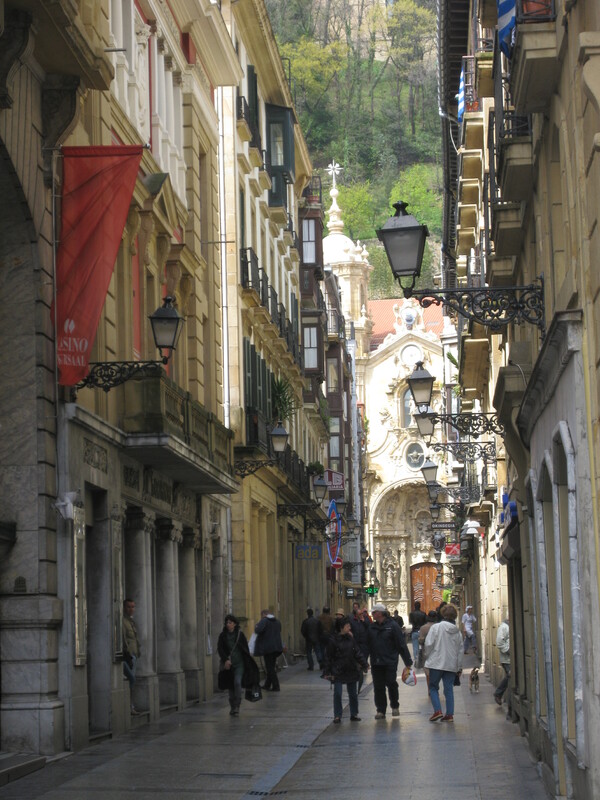 Donostia is the Basque name for San Sebastian. When you travel to Euskadi, pintxos are probably as close as you can come to “fast food.” You can have a fast, relatively cheap meal made with fresh ingredients. 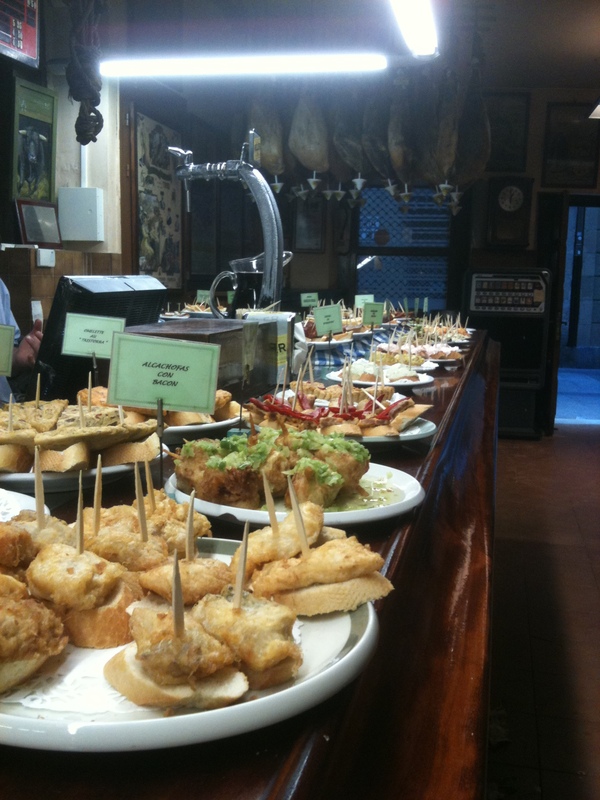 As you can see, the bar is loaded with pintxos … all different and all delicious! It has been a month since my daughter and son-in-law had their pintxo party. 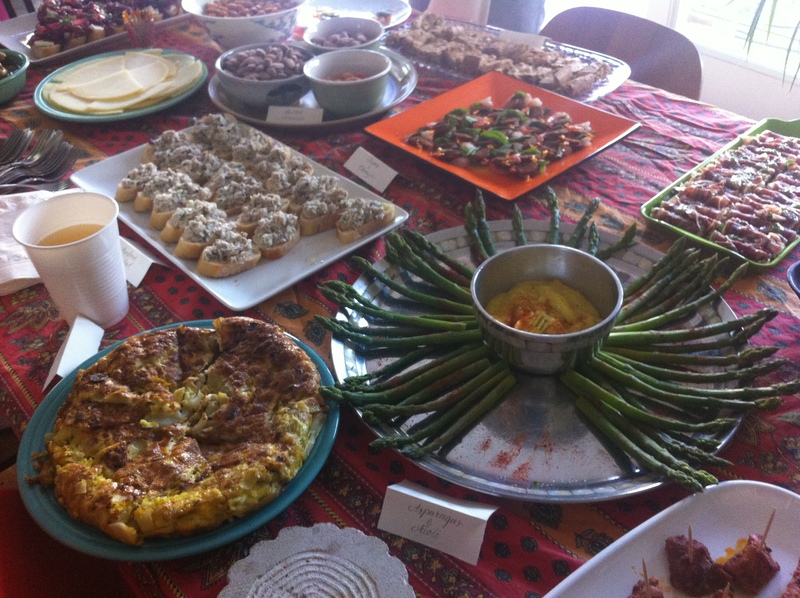 My daughter and son-in-law love to cook, so a tapas party was right up their alley. The recipes came from different sources: cookbooks and a new app I got for my iPad that shows step-by-step instructions and a picture of the finished dish. The app is The Photo Cookbook-Tapas. I think it costs $3.99, but I think it’s worth the money. There is also a wonderful book, Tapas of San Sebastian by Pedro Martin. The forward was written by Juan Mari Arzak, considered one of the great masters of the New Basque Cuisine. There are over 500 tapas recipes from 150 chefs from the bars and restaurants in San Sebastian. The instructions don’t give the amount for the ingredients. You have to do some guess work, but the photos of the food are phenomenal and it gives you an idea of what is available at the establishments in San Sebastian. I’m not including all the recipes for the party. In the photo you will see there is asparagus, and that was served with an aioli sauce. There was also chorizo, shrimp and basil on small skewers, salted almonds, plates with assorted cheese and meats and a bacalao dish. Everything was delicious! Saute 1 red onion with salt and pepper until translucent. Add 3/4 cup creme de Cassis and 1/4 cup red wine vinegar to the onions.
. Cook for about 4 minutes until onions are shiny. Stir in 1 Tbsp granulated sugar and cook for one minute, then remove from heat. Set aside. Slice baguette and goat cheese. 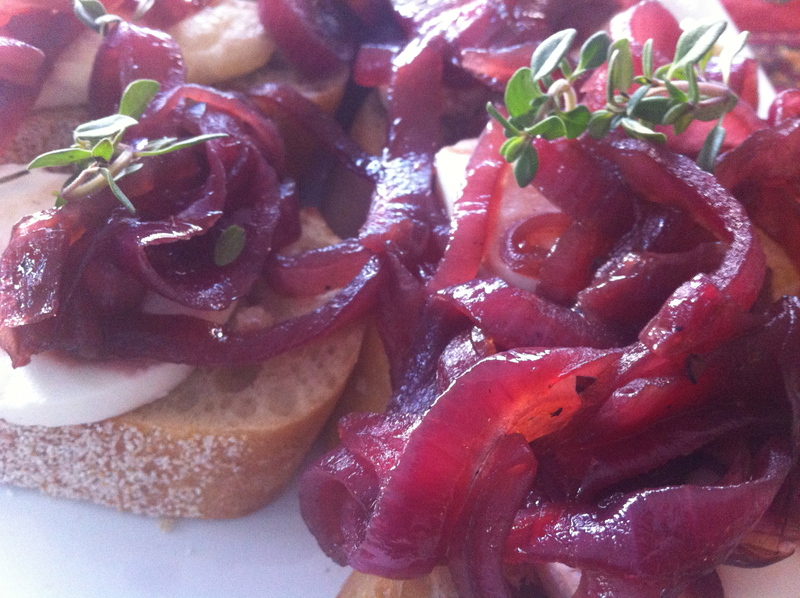 Add slice of goat cheese, then top with the braised onions and a little fresh thyme. 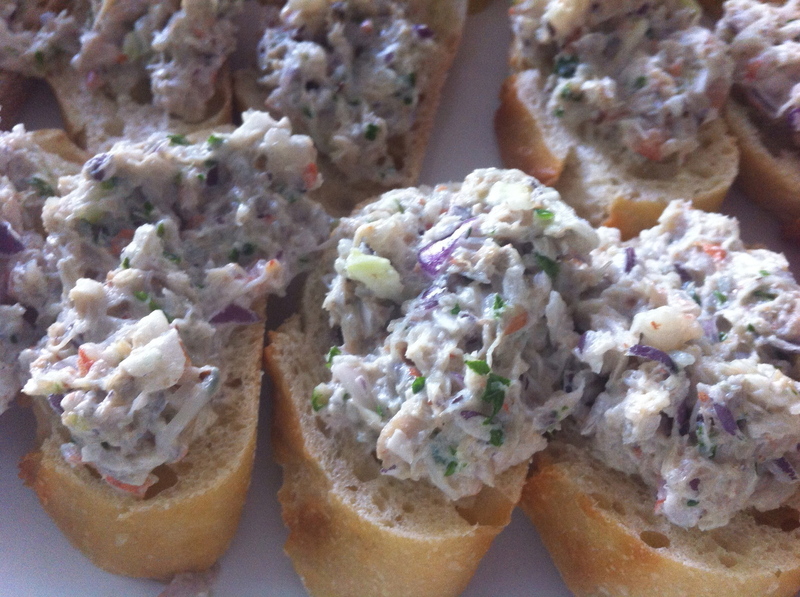 As soon as we ate this seafood salad, we all said that it tasted just like the pintxos we had in Donostia! Put a heaping 1/2 cup small shrimp and a heaping 1/2 cup white crabmeat into a bowl and stir together. Add 1 celery stick, finely chopped, 1 small red onion, very finely chopped, 6 Tbsp. mayonnaise, and lemon juice to taste. Season to taste with salt and pepper. Stir in 2 Tbsp finely chopped fresh parsley. Slice 16- 20 slices from a baguette. Mound the mixture on the bread slices. Heat 1/2 cup olive oil in a 10 inch frying pan over high heat. Reduce the heat, then add about 1 pound of baking potatoes that have been peeled and thinly sliced and 1 large onion chopped and cook for 15-20 minutes or until potatoes are tender. Drain the potatoes and onions through a colander, reserving the oil. Beat 6 large eggs in a large bowl and season with salt and pepper. Very gently stir the potatoes and onions into the eggs. Add 4 Tbsp of the reserved oil to the frying pan and heat over medium heat. Add the egg mixture and smooth the surface with a spatula, pressing the potatoes and onions into and even layer. Cook until the base is set shaking the pan occasionally. Use a spatula to loosen the side and bottom of the tortilla. 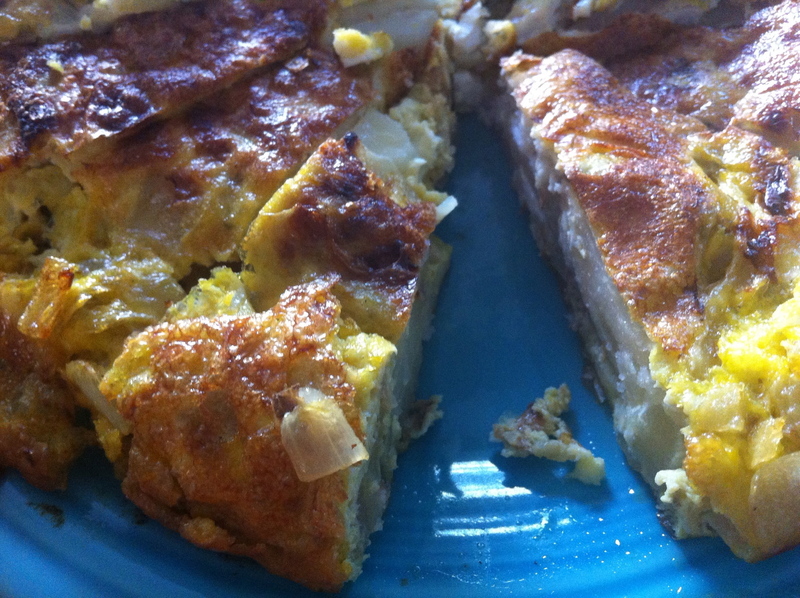 Place a plate that is as large as the frying pan over the top and invert the tortilla onto the plate. (I find that this step is best done over the sink, just in case!) Gently slide the tortilla cooked side up back into the frying pan. Continue cooking for 3 to 5 minutes or until the eggs are set and the base is golden. 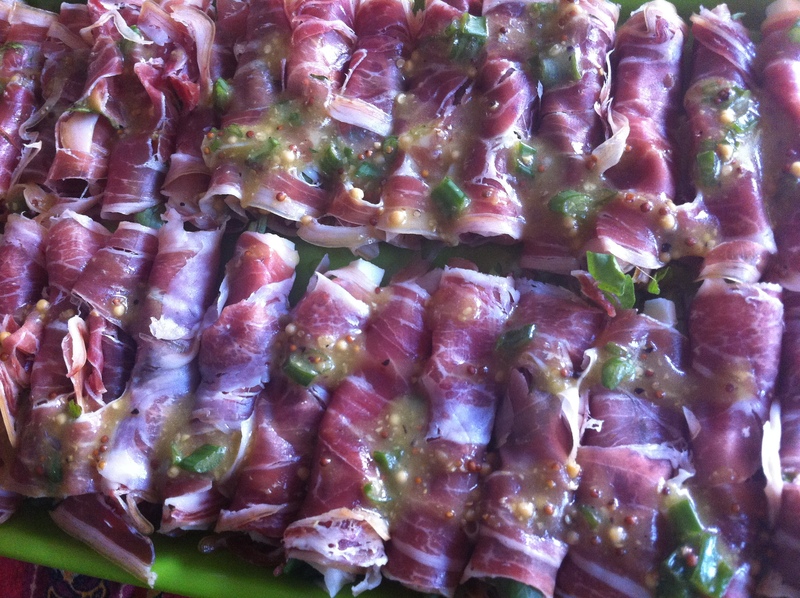 Wrap watercress and pecorino Toscano (or any hard cheese) in a slice of prosciutto. Place on serving plate. Grind fresh cracked pepper on top. Make a vinaigrette with freshly chopped chives, mustard seed, lemon juice and olive oil. Drizzle on top of the wrapped prosciutto. Trip of a lifetime to the Azores! Starting a new career at 60 years young! I am married to a man who’s grandparents came to America from the Basque Country. My grandparents came from the Azores Islands and from Spain. The Spanish side most likely has Basque in there somewhere along the line. I am a cook, not a chef. My recipes come from all over. As this blog progresses I will attempt to share my recipes. Looking forward to this new experience. I also write a blog called the Bean Sack Blog for the California Dry Bean Advisory Board. This is an exciting adventure for me, so if you need some bean recipes head on over to calbeans.org and please follow California Beans on Facebook, Twitter, Pinterest and Instagram! Thank you!